Mark teaches you the ins and outs of a Stevie Nicks and Fleetwood Mac fan favorite. After Mark plays the full song demo, Marla (Mark's lovely wife) joins him and sings this beautiful song. I question the 74 BPM. I tried but I find it to be slow. Mark, you do not play it at that BPM, but around 150 BPM. Is it written at 74 BPM to begin with, then build up speed? Not sure if Mark is still with JP, but thanks much for the lesson. It took me while to learn, but I can now play cleanly with you and your Mrs. Thanks very much, Mark! Excellent lesson! It made this song so easy to learn. I enjoyed the performance at the end too. Really nice! Cheers. I had been working with the supplemental and your video but I was having a problem getting this to sound like the recording. On the 5. 4, 3. 2 strings ( on the first figure) sounds like it should go 5 then 3 then 4 then 2 (no two string pluck) and then right to the G/B shape with the same pattern. I know you said Lindsay Buckingham plays it differently in the beginning but it is a little difficult to make your pattern "sound right" if you are familiar with the song. Well I went back and listened to the recording again and I would say that the pattern on the recording is 5 then 3 then 4 then 2 then 3 then 4 moving the shape to G/B and keeping the pattern through the verse chords. I am enjoying the landslide lesson by Mark. However I am disappointed that I can not print the supplemental material. Without seeing what the supplemental material looks like I can not determine if it will be useful to me. I was able to print the entire supplemental material. Have you figured out why you are unable to print? Superb lesson. Thanks Mark and Marla. Wonderful job on the full song at the end. Hope you two do more of these for Jamplay. Mark and Marla sounded fantastic together! Very good lesson, Mark, and thanks for including the solo as part of the lesson. That's the one section of this song that I've always wanted to learn, but could never figure it out on my own. Thank you Mark (&Marla!). Excellent lesson! Thanks Mark! Working on achieving the target BPM and the solo now. The solo is slow going but I'm determined. I want to thank you and Marla for showing me the way. A dream come true for me. Fantastic duo!!! One of the songs I've always wanted to learn how to play; thanks for the lesson Mark and Marla. great song & great lesson Thanks mark. Mark, Thank you for this great song. Where are the chords for the solo part of the song? This song is beautiful. I was in college when the album came out and it was magical. I am somewhat of a beginner but I am mastering this song. It is hard for me but you taught it great and I appreciate it. Thanks. Thank you for this. I've always enjoyed this song and now I can play it. I really appreciate you including the solo. Any chance you can do a lesson on Little Martha, by Duane Allman? Great lesson Mark. Thank you so much. Would you mind doing an add-on sometime to show us some of the other right hand picking that can be done? great lesson. what a beautiful song and vocals by marla are exceptional. Fantastic - can't believe I've waited 4 years to try this song - next up for me is that solo - my daughter sang this song at her Christmas recital this year. Wish I'd learned it before so I could have accompanied her - next year maybe... Love it when you and Marla do these demos! I'm having a hard time following your lesson. I knew how to play the intro, but it seems you're going through everything a little too quickly. Mark, Where are the chords for the solo part of this song? Hi! Just played along with with Mark and Marla's performance. What a treat! That was a fun way to practice this song! Hi, I am trying to play Lanslide with some problems, I can't seem to get a full screen to see the finger picking. The other lessons I have taken was full screen. What can I do? I am really enjoying the lesson and love the song. I am new to Jamplay so I'm sure it's me. Thank you ! I got the finger picking already.. and the chords too. However, the glitch you mention at 3:45 on.. it's very confusing the way it's explained..and I keep getting frustrated. I read you explanation on another post, but still confusing, , I tried to follow your instructions and it doesn't sound the same.. Hopefully you can demonstrate it from a different angle, slower and the whole glitch without stopping until you change the chord to continue with the regular picking.. Thank you very much! 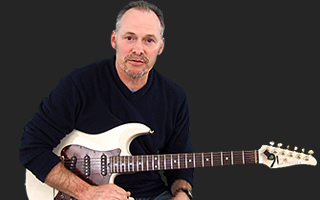 http://members.jamplay.com/guitar/phase-3/lesson/634-landslide?playlist_item=4&start_time=231.141& right here! thank you very much for your reply! Still waiting on response..Thank you! wow.. still no response eh?.. haha. Thank you! Hi I found it hard to follow the video for that section and instead followed the tab, if you do that it's easy. Mark, excellent job. I belong to several different wedb sites that have instruction but this is by far the best... money well spent. Thank you . I look forward to more finger picking classics from you. Very nice! Amazing job by you and Marla. I can't play the d over f# - hands too small, fingers too short - is there a substitute chord? There are a couple of optional fingerings you can try....try using your thumb on the second fret of the low sixth string, and your middle finger on the second fret of the third string, with either your pinky of ring finger on the second string, third fret, although your hand may be too small for this, too. You could also just play a regular D chord, but you lose the nice descending bass line. Never mind Mark didn't look high enough on tab! Thanks again for great lesson! Mark What a beautiful song and thak you for playing it. Do you have the tab for the transition back to C in the solo. It's not in the notation and I just can't seem to wing it from the video. Thanks and great job! Mark-simply fabulous! I am such a novice but this has allowed me to almost play this beautiful song. One question: Most of the song is played on the middle four strings in the picking pattern. However in the chorus there are a couple chords that move to the low E string. Does that mean you move the same picking pattern down to the E, A, D, and G strings? Mark I love your teaching technique and your great technical skill. Thanks Mark and Marla! Mark-Please disregard my previous question! I should have been paying better attention. You explained it perfectly in the lesson! !Thanks again. Mark - absolutely superb. The other day, I downloaded the chords from a website and while they may be the original chords, they were so blxxdy difficult that I gave up after 10 secs and I gave up hope altogether until I found your lesson which instilled confidence in me again. Thank you soooooo much and to your lovely wife. Will practise this song with my daughter Fiona tonight. Regards from Switzerland. fantastic! loved your lesson, thanks! Awesome and inspiring. Thank-you both. Great song and lesson. I've been gone a while but am back. Seems like some of your songs are gone, like Stairway, What happened to all your songs? Marla and I do this one with our duet.....that would be a great choice. If you're having trouble with the solo (this part goes by fast in the video), everything you're missing from the video is in the supplemental content (tabs and music). This is the first song I learned on my guitar and thanks to Mark I was able play the whole thing, including the solo -- but since I'm a beginner I COULD NOT have learned it without the supplemental materials. of course you know I meant "hard one" , I hope...thanks for the lessons! Mark, when you say "ok, on the Am7 I'm gonna do this" and then just do it and not explain exactly what you did as you had earlier in the song, it makes it extremely difficult to follow. At least for me. Any helpful hints to figure out this solo? I'm stuck! Check out Scene 6.....all riffs of the solo are presented at slow speed. Because of this song, I joined Jamplay. Looking forward to more acoustic lessons with you, Mark. Also, Marla sounds better than Stevie Nicks, in my opinion. Thanks Mark! I joined Jamplay to clean up 2 years of being all over the place in my lessons. You and some of the other instructors (LIsa, Eric and more) have set me on a much more focused path and this song has been the result. I play it finger style and hybrid and almost have the solo. Thanks to you and Marla. Hey, Mark, I joined jamplay because of this lesson. Thought you might want to know. Also, I am performing this piece this Wednesday in NYC. I just hope that it won't be too difficult to pick when I am nervous. I did well up until the solo and then got a bit nervous hearing only my guitar over the loudspeakers. Hopefully I will do better next time. Thanks. Watch Scene 7...Full Song Demo without vocal. Mark, What a great lesson. I am a beginner and haven't mastered the solo but how exciting it is to play some of this song. Your wife's vocal really solidified the song. Well done Marla! I hope more acoustic rock like Fleetwood mac and Jackson Browne will be in the future as this is where my interest lies. I just wanted to thank you for giving me this song. This is why I joined! You and your wife did an excellent job on this song. Thank you. I admit I am kind of disappointed there is not more singing with the guitar playing on Jamplay as done with this song. I think it is a good way to put a song into context. Thank you. Check out my Aqualung lesson. Mark, I have a tendency to cut my index finger out of this pattern and just alternate (as with the thumb) the middle finger. Is this going to be okay or should I break myself of this habit? Thanks. Excellent teaching. I would say whatever works to get the job done is fine. A lot of great players have their own different techniques for fingerpicking. But I would encourage you to get your index involved as it will open up a lot more possibilities of picking patterns and you'll find yourself developing a much smoother style. Give it a shot....Mark B. The note you slide into has a short straight upward line before the notehead on the standard notation. The hammer-on is indicated with a slur marking, which is a curved line connecting two different notes. If the second note goes up, it's a hammer-on; if the second note goes down, it's a pull off. The curved line between two of the samed notes is a tie, and this indicates you sustain the note for the combined value of the two notes. Such a great lesson! I love how you break it down into the separate verses and explain the picking pattern. I can now play this song, but without the solo part, still working on that. The performace at the end was great, I really enjoyed it! Thank you! really super beautiful performance. mark, any ideas about doing some of the more complicated lindsey buckingham style for this great tune????? Lindsey Buckingham, as far as I know, plays strictly with his fingers...no pick. I haven't studied his playing techniques in depth, but again, I'm pretty sure he does all his riffs with his fingers. On Landslide, it's an alternate thumb bass picking pattern...Travis picking, that he uses. The top notes of the arppegios and melody notes in the solo are played with his index, middle, and ring fingers. Take a close look at video, and it should shed more light on the subject. just signed up for a month. thanks for your reply Mark. I thought I remembered seeing Lindsey doing this live and fingerpicking with a lot more notes. and it sounded great. I'll have to check out youtube. Yea...his live performances that I've heard have a lot of new improvised stuff in them. Very cool. He's got great right hand finger picking technique. Yes I started a few days ago with minimal time, but I have gotten the fingerpicking down, now it is off to the chord changes and the solo. Having some issues with the glitch before the chorus, Am7, maybe you can clarify I didn't see any notes in the tab. Or I will just continue to play it over and over. I appreciate you work on this and the nice job you and Marla do with the song. Very Very nice. The Amin "glitch" that I am referring to appears in Scene 4: Verse chords, at the 3:35 mark in verse 1, just before verse 2. It is on the supplemental, page 2, bars 19 and 20. Notice that the Amin arpeggio in bar 19 extends into the first 2 beats of bar 20. After you play the arpeggio on the Am in bar 19, stay on the Amin into bar 20..the problem you might be having is that the right hand picking pattern changes. At bar 20 (still on Amin), pick the 5th string with the thumb and the 2nd string with the middle finger together and hold that for a quarter note...1 full count. Then continue with the thumb on the 4th string and index on the 3rd string seperately as eighth notes. At this point you are at beat three and here is where you change to the G/B chord playing the pattern in eighth notes. Check out the video again at Scene 4 at the 3:35 mark....let me know if this helps, and if you get it down. It is a little tricky, but the beauty fo the music is in the details, and it's well worth the time and effort to get it right. Good luck, Mark B. Thanks Mark I will give this a shot and let you know I am at work now so I will try it tonight when I get home. I think I got the glitch down, more practice but at least now I understand what it is, now I just need to work on the solo and I will be able to play the whole song still with much needed practice I will get it down perfect. Thanks for making it so easy to learn. Yes, I am really enjoying your lessons also and I got the picking pattern down pretty well and getting stronger on the chord changes, but I too am having difficulty understanding the AM7 glitch. I hear the difference when you play but do not see it in the tab as to which strings or notes are played. My ears are not trained well enough yet to be able to say exactly what the difference is or how to play it I just know it is there. I know others have had the sae question but I did not see a definitive answer. Hope you can help. Great job by you and your wife!! Many thanks for this. Your teaching methodology for this delivery format is excellent. Learned to play the whole song in about a week of evenings. Cheers from Ottawa. Mark, really great lesson. I had been wanting to learn this one for a long time. You broke it down for us so that the chorus and verse weren't as intimidating as you hear on the radio. The solo took the longest for me to learn, but now that I have I can say that I know the song now. Thanks for a great lesson! Hi Mark. I followed your course 1, which was great by the way. Even though I was more of an intermediate player, I am very glad I did, because it really improved my rythm. Now I am obsessed by the metronome. :) On paper (suplemental content) it says each quarter note is 140. But on my metronome you play each at 155 which is exactly like the orignal. Is my metronome wrong or is the paper wrong? (Because I notice that there are several songs not equal to my metronome and I have to listen to the orignal first to have a precise figure.) Thanks a lot for your great courses!!! I 'd be very happy it there will be a phase 2 course!!! Hey Tom...sorry for the delay in a response. I'm sure I'm playing it faster than 140....so you're probably correct at it being about 155. The tempo of this song, I think, can vary depending on your interpretation, or in your mood at the time of a particulat performance. Try varying the tempo and find a spot that feels good for you. The tempo might also be determined by where the vocalist likes it, too. Let me know how it works out for you...Mark B.
Hi Mark, thanks for a lovely rendition of this tune to you and your wife. Is this picking style also called a clawhammer ? Hey Jason....I've heard that term before, but I'm not exactly sure what it means.....maybe someone can help us out on this one..I've aways called this style of alternating bass notes Travis picking. I'll have to investigate clawhammer....Mark B.
hey mark , what type of martin do u use in this lesson? Check my comment from March 17th. Hey Mark? I seem to have a problem... I'm picking away smoothly and then all of a sudden I completely miss a string pluck. It's like the offending finger just does a low flying near miss... any suggestions to correct that? Hi Sylvia...good to hear from ya! Right hand position when fingerpicking is important. The plane of my right hand is flat, with a slight curve of the wrist. Relax the forearm, wrist, and hand. Curve the fingers naturally, and keep the thumb out in front of the index so they don't bump into each other. Hover the fingers over the strings as you play, and don' t rest the fingers on the strings unless you anre trying to dampen strings. Slow the picking pattern down to a tempo your comfortable with. Practice it until it becomes second nature, then gradually increase the tempo til you're up to speed. With practice, you can do this in your sleep. These picking patterns become a natural thing, with very little thought. Good luck...Mark B. Hang in...I'll make an edit on the tab to include the right hand picking for the solo. thanks for the reply mark, I am still learning my way around this web sight , I am trying not to get frustrated ,but I work 3 jobs and trying to find time to play my guitar , I am just glad that I found this sight , it has helped me get rid of some of the daily stess , I finally got down ( she talks to angels) excellent song ,thanks for teaching us that song , I was also wondering if you were going to teach (dust in the wind by kansas ) that song uses travis picking also ? I'd love to do a lesson on Dust In The Wind......I'll keep that one in mind. yeah, I play in the more classical position normally. What is happening is I miss the middle finger pick right after the second beat of the measure. I just completely miss the string. LOL It did take me a while to retrain for this pattern because the way I play dust in the wind is slightly different than this. I'll keep trying going slooooooowly to see if it gets any better. Hi Mark, thank you for this great song and lesson!!!!!!!! When do we learn the next new song from you? Mark, I too am having trouble with the "glitch" between verses 1 and 2. The specific passage starts 3:40 in on the verse chords section(scene 4). Please clarify which strings are being used. Thanks much. Am enjoying this immensely. Any plans to do more Fleetwood/Lindsey? Mark: Where the tab say "let ring" can you please explain. I have seen that elsewhere. Thanks. Hey Christopher....good question. When the notation "let ring" is put on the music, it's normally in an arpeggio passage, meaning the notes of a chord are played in a broken, single note style. Let ring simply means to let all the chord tones ring freely as you play them. Do not stop the resonance of any of the stings. It's the same effect you get when you depress the damper pedal on a piano as you play chords. You two sounded great together!! mark im a little baffled with the (am7- glitch ) part. i cant seem to get the picking right, watch the vid and read tab numerous times , any help ? Kyle...can you give me the specific bar numbers in the tab you're talking about...then I'll see if I can give you suggestions....Mark B. Hey Mark, Thanx for another awesome lesson. I have now got the picking pattern on auto pilot but the solo is really hard!! Just taking it slowly bar by bar at first. Would be great if you could post some more acoustic lessons soon. These are the best things on the site. Thanks to both of you. This is another song that I have always enjoyed listening too. And I hope one day to learn to play it as well as you do. Another great lesson Mark. Thank you. I'm a bit confused on going from v.2 to chorus. You said D7/F#, and that it's the same picking pattern but different first note. That looks like what you are doing, but the notation shows the first note on the 5th string. I'm guessing that was just a typo? Hey Sean...glad you enjoyed the lesson. I checked the tab and it looks correct. The D/F# going into the chorus starts with the 2nd fret sixth string (F#), together with the 1st fret second string (C). Hi Mark, a great lesson. I purchased the sheet music for this song (before I joined Jamplay) and they have a different pick pattern where the rhythm is quite different. It has an 8th note pair to begin with 16th notes till the chord change. The note are ordered differently eg. You have C-G-E-C, the other version is C-E-G-C. Your pattern sounds more like what I have heard, but now that I have learned the other pattern it creeps in while I'm trying to learn this one. Any suggestions on how to purge this other pattern? I realize that the pick pattern is up to the performer, but yours has a better feel to it. Oh, and to purge you of the other pattern....slow practice with a metronome. Hey Warren...good to hear from you. I just listen to Lindsey Buckingham play this and the pattern is definitely CGEC...the thumb plays the C and E on the beat, and the fingers play the G and octave C on the "and" of the beat....so the way I'm playing it is correct, except I added an extra note...the octave C along with the bass C on beat one....guess this came about from years of playing and improvising the song. It still has the some feel, but it acentuates the first beat of every bar. You can leave the octave note out if you like, and just play the bass C with your thumb on beat one......my beat and tempo on my tab are different than the version you have. Mine is counted with eighth notes and quarter notes at 140 bpm.....hope this all makes sense and doesn't cause any confusion....Mark B. Thanks for the clarification Mark, it makes perfect sense...Ok off to purge the other pattern. I'm with you! I keep doing it backwards. LOL sounds ok... but a bit crazy making. Hey Jim, I am having a bit of trouble with clean picking. Do you have fingernails are do you just use your fingers? Hey Randy....I use fingernails. You don't need to grow them too long..just a bit over the fingertip. what you want is not only the fingernail come in contact with the string, but also a bit of skin from your fingertip, so dont' grow the nail too long. After you pluck the string, be careful not to bump another string, and don't place the finger on the string prior to plucking..the right hand fingers hover over the strings with a slight curve...hope this helps. Mark B. Hey Jim....welcome to Jamplay, and thanks for the nice comments.....My Martin is a custom shop model. It has a three piece back like a D-35. It's a dreadnought witha cutaway. It also has a lot of nice inlay work with abalone and mother -of-pearl around the soundhole, bindings, fretboard, and headstock. It has a Fishman Prefix Blender preamp...nice ax. I love it....talk to ya soon...Mark B.
great lesson, especially the full song demo with the vocals. she has a really wonderful voice. i actually thought the song sounded better capoed on the forth fret. you two sound great together. Nice Mark & Marla need more of those.great job. Wow, I've been struggling with this entire song for years (I had some fundamental mistakes in my tab version). This was a fantastic lesson. Hey Mark, this is truly a work in progress for those of us who are not finger style pickers- but the way you portray this song certainly makes me want to be one! You have a great teaching style and I'd love to see you do more stuff like this, She Talks To Angels etc as I am not really into the Pink Floyd stuff. Keep'em coming! Thanks Jay....I plan on doing a lot more acoustic stuff, and down the road we're planning a Phase 2 series on acoustic guitar styling, which will no doubt include finger picking. Stay tuned...Mark B. Mark - dude, you are a stud! Just in awe of your style and solid teaching method. Keep it coming brotha! One comment: The solo part played on the high E and B string was WAY FAST and even after 20 re-winds, cannot get it. Any help would be appreciated. Daniel...good to hear from you. Yea, that riff is a challenging one. Comes from the fingerstyle single note technique. Make sure you alternate r.h. fingers while picking, and free stroke. There are a couple of slurs in the riff too that will help: In bar 59 slide up from the 3rd fret to the 5th, then slide bar to 3 (the tab doesn't show the slide down) under one attack. In bar 60, pull off from the 2nd fret to open. This should help you out. And get out your metronome and practice at a slow tempo till steady, then gradually bring up to song tempo....good luck, talk to ya soon..Mark B. Mark, do me a favour...slap a postage stamp on Marlas forehead and send her to the UK. There's a good chap. Yes, it's all there....bars 45 - 60. Seems complete to me, page 3 of the supplemental content, about half way down. Every time I hear this song it sends chills down my spine. Though many of the lessons and demos I've worked with on this site are well done, this is by far, the best. Of course the selection does skew my opinion. I love the way all of the instructors on Jamplay seem to come in to my den to give private lessons. This is why I no longer take lessons locally and will probably a life member of your site. Hats off to Mark and Marla on their heartwarming performance of a true classic. Love when you end Mark's song lessons with the husband and wife duet...great job!!! Thoroughly enjoyable!!! I'm not even close to the point where I could play that but enjoyed it none the less. Thank you. Great lesson Mark! Having Marla singing with you in the demo seems to help bring the lesson all together. Thanks to you and Marla! Nice Mark & Marla, Thanks for a great lesson and great mini concert!!!!!! Gotta love the Mac. thanks for teaching this one Mark!